As on stage comedy is played out, so too in the paintings for his anticipated solo debut next month titled Satire in Paint. A theatre for a jester. Nurazmal’s paintings are quiet. Still, the colours are soft thinned out layers capturing comical situations set against eerie austere settings. In one, a seated conversation, another an overheard conversation each with overtones of dread, disappointment, veiled with dark humour; seated clown dolls and hand puppets are ironically interpolated into what are otherwise mundane events. 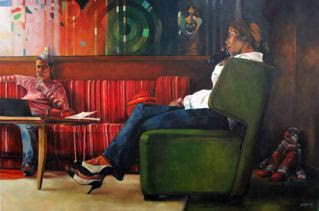 In one painting entitled ‘HELLO’ there is utter seriousness on the faces of the people deep in conversation. Each of the objects, the present, the note and the dead clown are pieces of a puzzle that suggest once pieced together tell a story of what has just transpired. In other works larger than life painted self portraits laughingly stare out from the canvas enticing you like an expert jester ready to entertain. The scale of these painted facial expressions fill the entire canvas, corner to corner demanding attention menacingly yet comically as you stand reminded of the image’s existence within a two dimensional boundary. 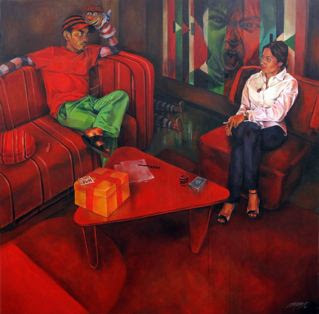 Nurazmal’s work is refreshingly far removed from what one is usually confronted with in art, no torturous painful images or politically loaded instruction. Out is the intellectual high brow meanings we are often left to interpret. What are on show are clever paintings that suggest we should be inwardly laughing with the artist. its great to see regular articles coming up on this site. Congrats and hope to see more. Would also appreciate if writers would get into details of artists techniques and not not simply message of the paintings. Is the artist a mix media artist or is he he a projector artist or does he paint free hand. I have no objection to any of the techniques but it does help knowing as it most certainly will determine the skills involved and hence the values. i think he use tracing paper. whatever it is he very talented. Artists should have no obligation to declare their technique only their medium. A projector isn't a medium. Next we will be asking whether the artist used a brush or pallette knife and if so to state it. Ultimately, it's the thought process and end result that matters. i agree with whats art. The artist has to describe his medium. And i would appreciate if the art writers go into technique and not simply message of the paintings. Art writers can infact provide relevant information for collectors and potential collectors. My comments have no bearing on this particular show whatsoever.